CERTIFICATE FOR INDIVIDUAL INCOME TAX PREPARATION SERVICE. FEDERAL-STATE AND APPLICABLE CITY RETURN MUST BE A FIRST-TIME CUSTOMER. 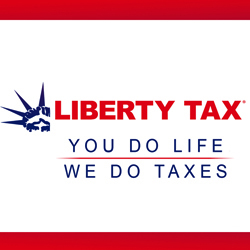 www.libertytax.com. SERVICE INCLUDES ALL GUARANTEES, INCLUDING ACCURACY GUARANTEE, AUDIT PROTECTION FREE COPIES, CORRESPONDENCE ASSISTANCE. MON - FRI 9-9 SAT 9-5. PLEASE CALL FOR APPOINTMENT.